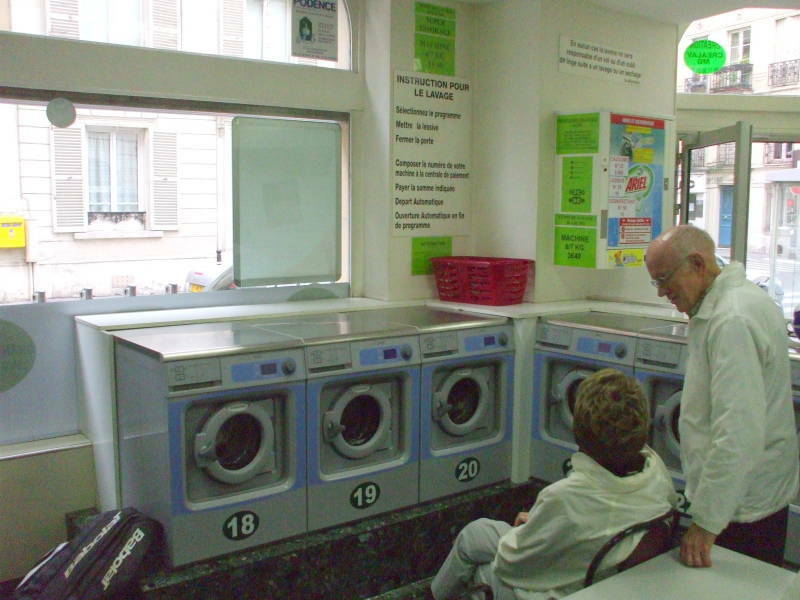 What do you do when you are traveling through France and you find that you are running short of clean clothes? You do a wash! 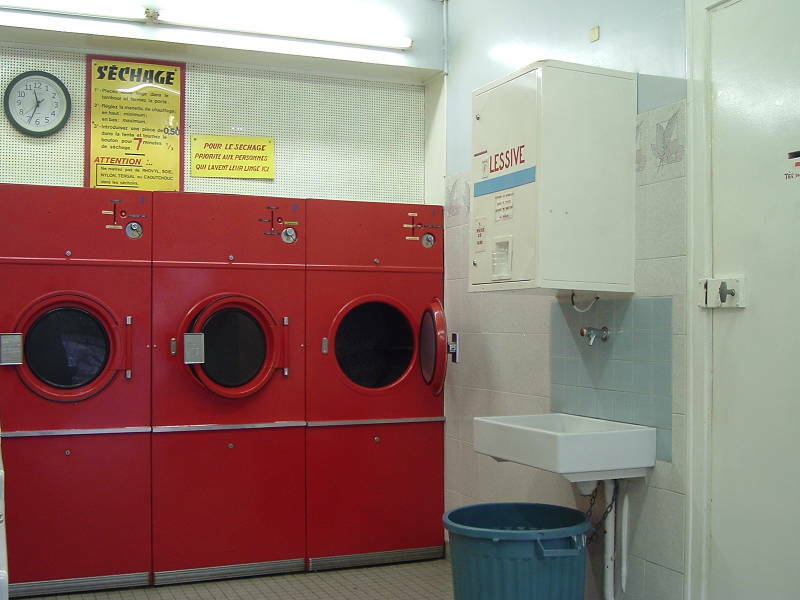 Exactement, you go to the lavomat and you wash your clothes! 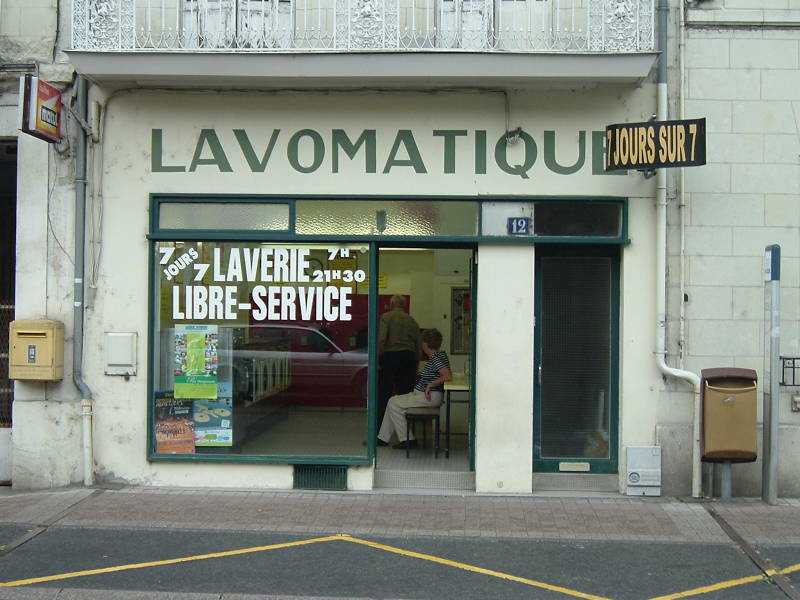 Here is how you can keep clean on the road with the French system of laveries, lavomats, et lavomatiques. 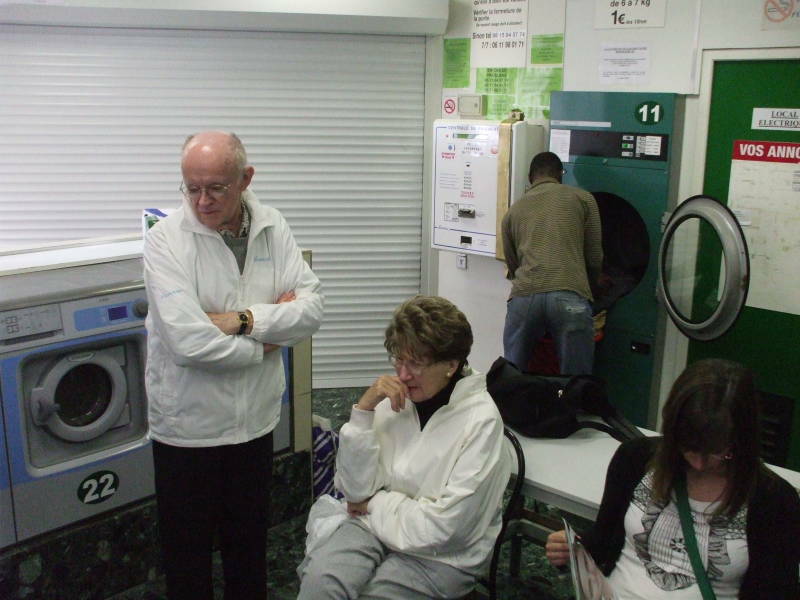 Arguments over precisely what these facilities should be called are linguistic hair-splitting misadventures, like debating whether the American laundromat or the British launderette is more appropriate terminology for an English speaker. The variations are all from the French word laver, meaning to wash, versions of which have been borrowed as far afield as the Turkish word lavabo for the sink found in small restaurants from İstanbul onward to the east. Meanwhile, English is largely a mix of Norman French on top of the earlier invasion of Frisian, with very little indeed of the original indigenous Brittonic Celtic remaining. 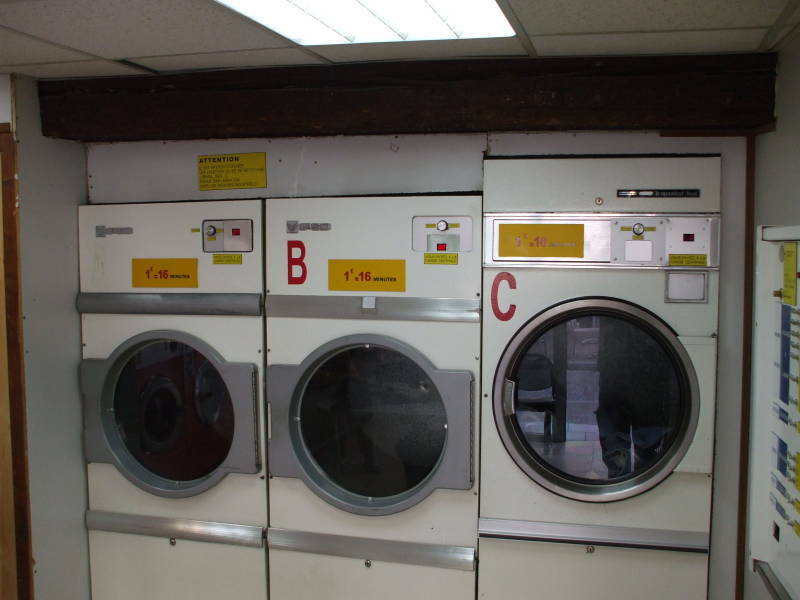 So, we have the supposedly "English" word laundry and so on. 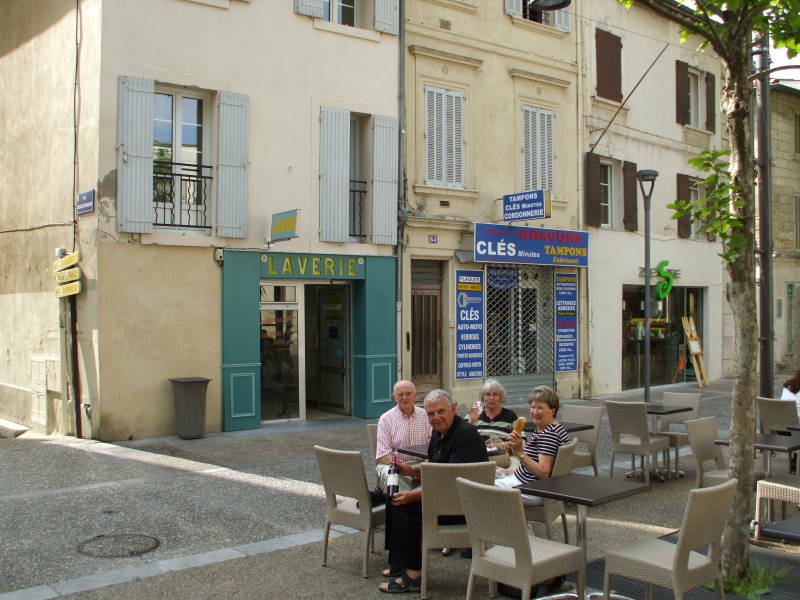 Here is a happy group of travelers enjoying an afternoon break with wine, bread, and cheese, in a small square in Avignon. These are my parents on either side, and their friends Larry and Shirley in the middle. These are two businesses in the background. On the right is a shop, closed at the moment, specializing in a variety of services including duplicating keys (clés) and making rubber stamps (or tampons, leading to some confusion among American travelers). On the left is the neighborhood laverie, which we need to use after a week on a rented boat on the Canal du Midi. The small street leading off to the left is rue Agricol Perdiguier. About two blocks up it to the left as seen here leads to the main street through the old city. Turn left there, and it's just a few blocks to the old train station. Local and regional trains still stop there. The TGV station is well outside the city and connected by a frequent bus from the old station. Hotel Splendid is a nice place to station in Avignon. It's just a block away at #17 rue Agricol Perdiguier, +33-(0)490-86-14-46, avignon-splendid-hotel.com. 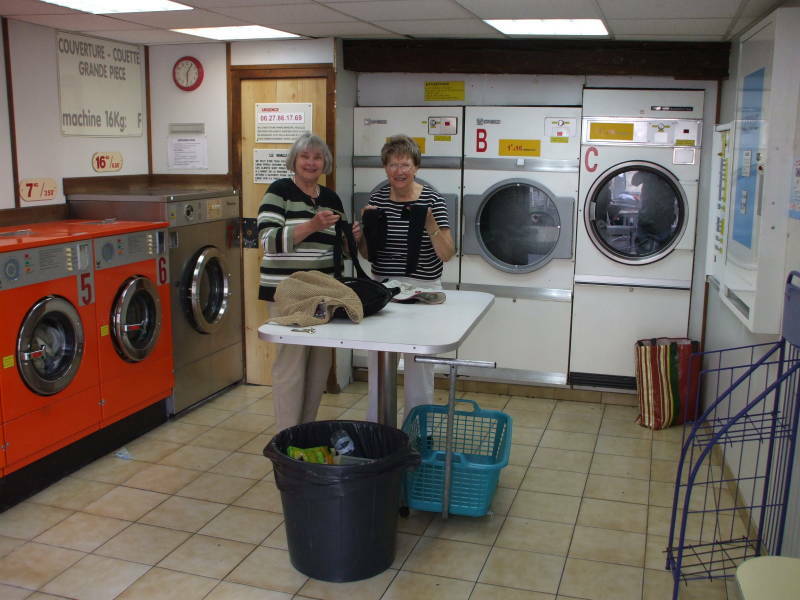 Shirley and my mom are sorting laundry into categories in preparation for washing. 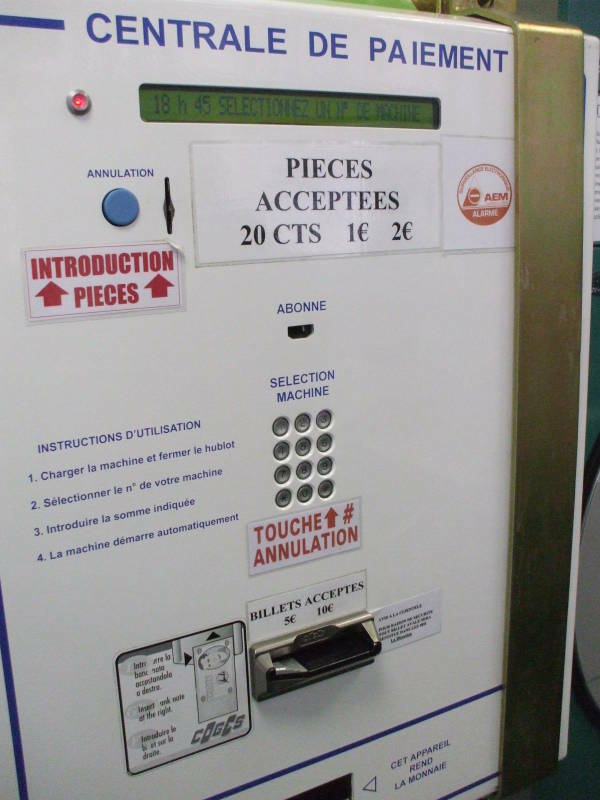 The caisse centrale or central payment console lets you purchase small packages of detergent and pay for the operation of the numbered washing and drying machines. 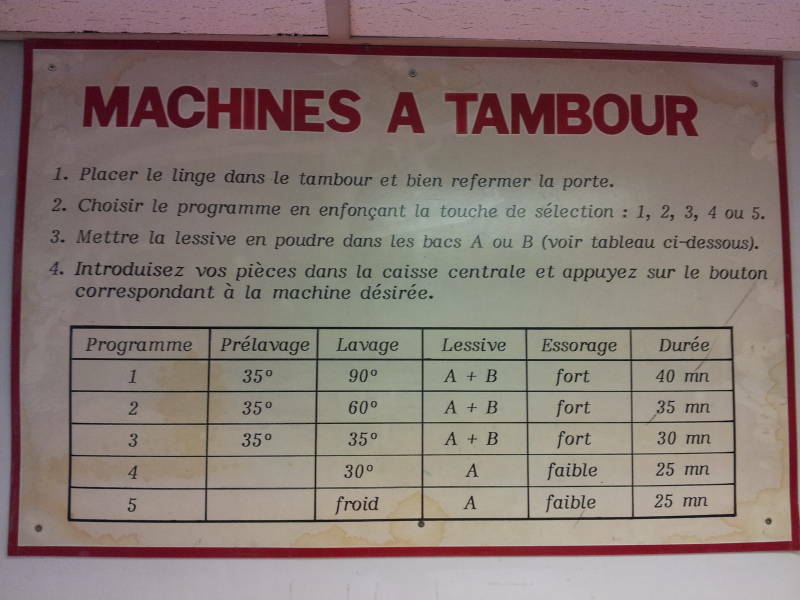 This one makes it easy with labels en anglais. 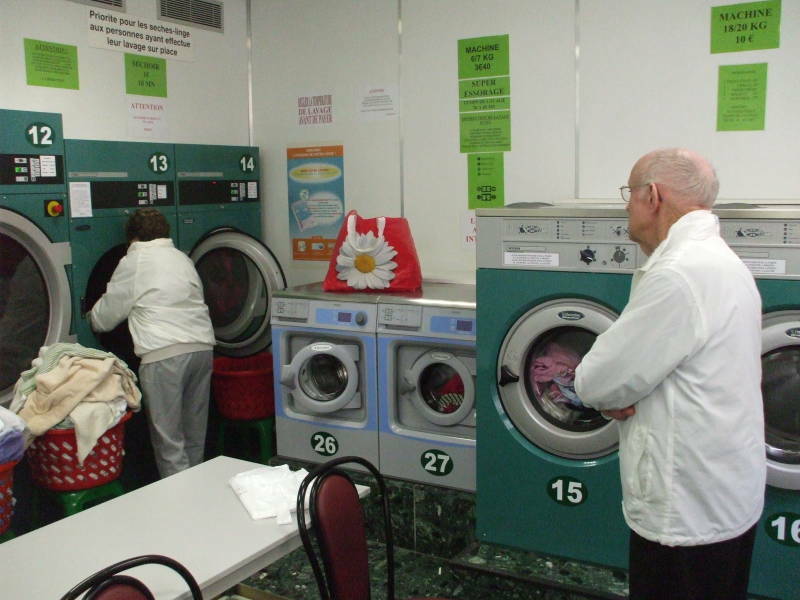 This laverie has machines of different capacities, 5 kg for 2.90€ or 7 kg for 3.50€. 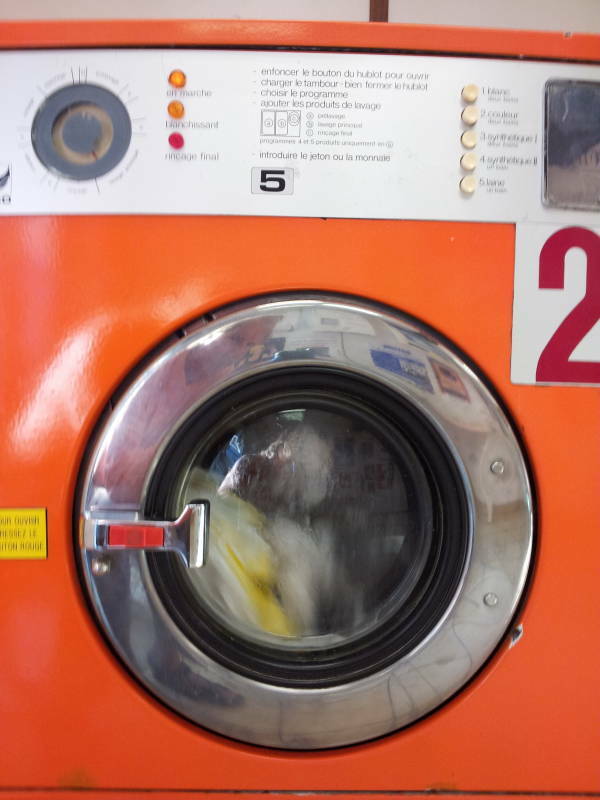 Then you simply read the directions on the machine: white with two cycles to get things as clean and white as the kepis blancs of the Légion Étrangère. Or, for the less adventuresome, two cycles for color, or two cycles for synthetic, or the delicate single cycles of synthétique II and laine. If you're still uncertain, a helpful panel explains it. 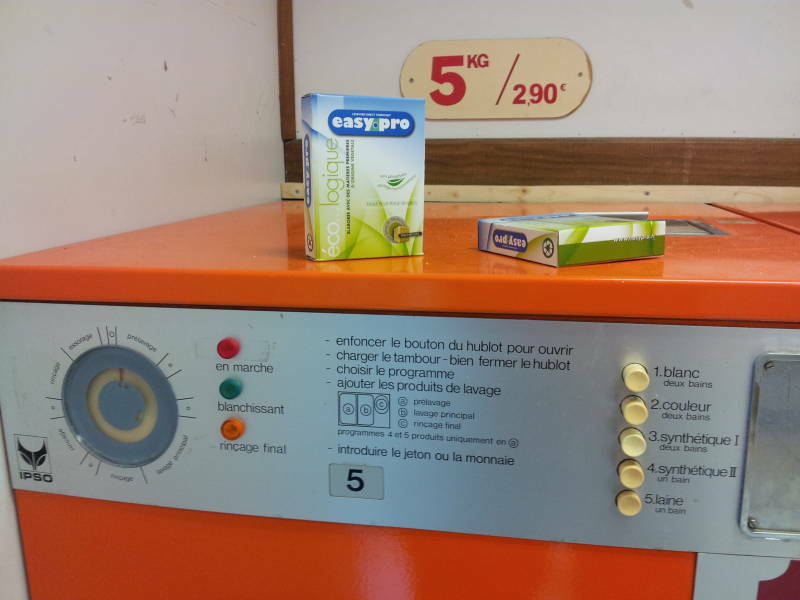 Mais sérieusement, vous devez utiliser le cycle de lavage le plus fort et plus chaud et plus long. That's going to be your best choice. 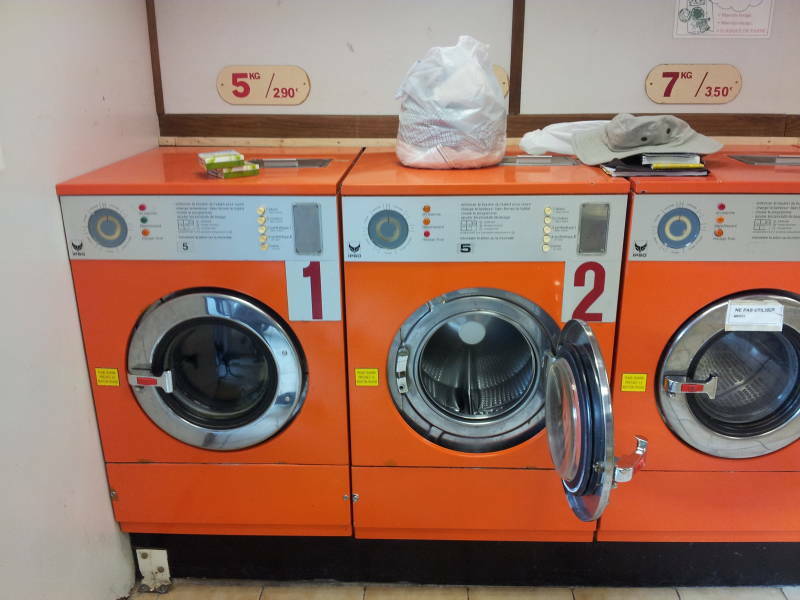 Then you can send your clothes into the driers to get them as arid as the deep Sahara. Saumur is along the Loire, southwest of Paris and south of Normandy. The lower Loire river valley is where the Academy Français has declared that the reference version of French is spoken. 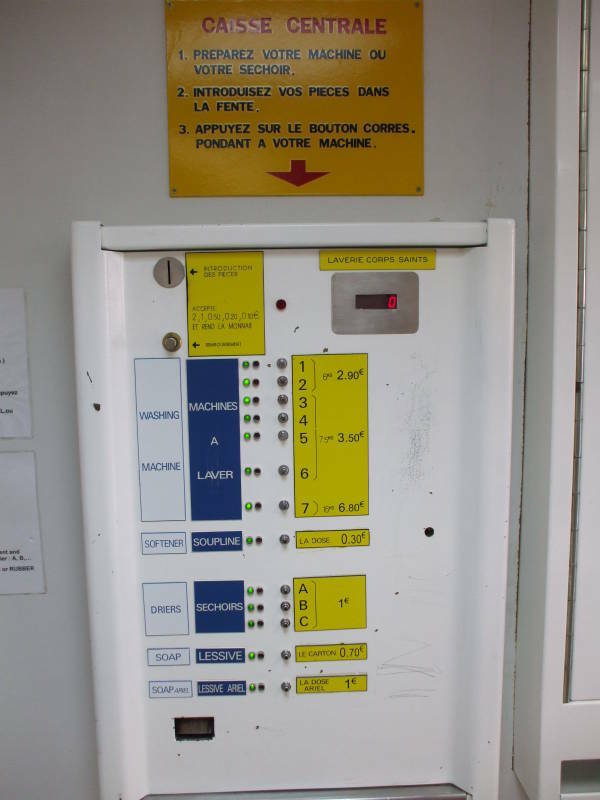 So, you should find that these people are the easiest to understand as they speak the classroom-standard Loire valley French. They also have easy to use laveries, of course. 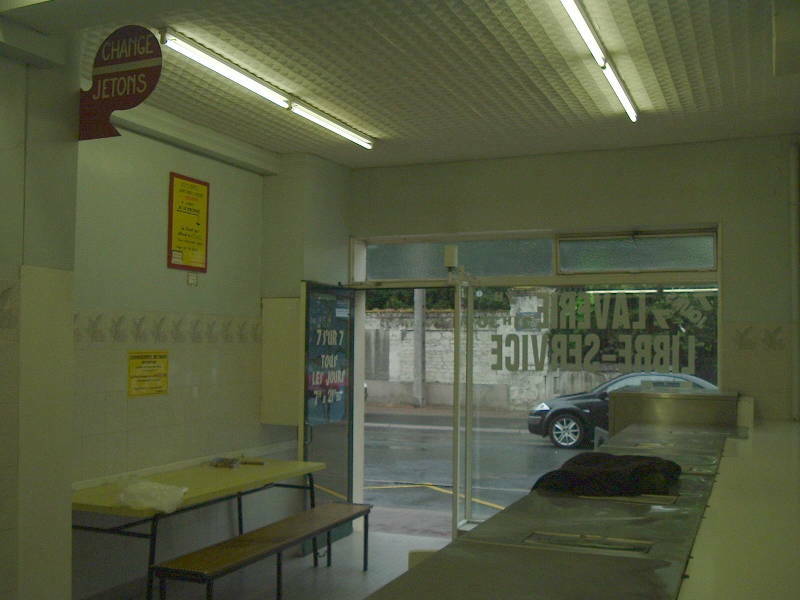 This one, branded as a lavomatique, is open 7 days out of 7, from 0700 to 2130. The City of Lights is, of course, also a Cité des Lavomats. 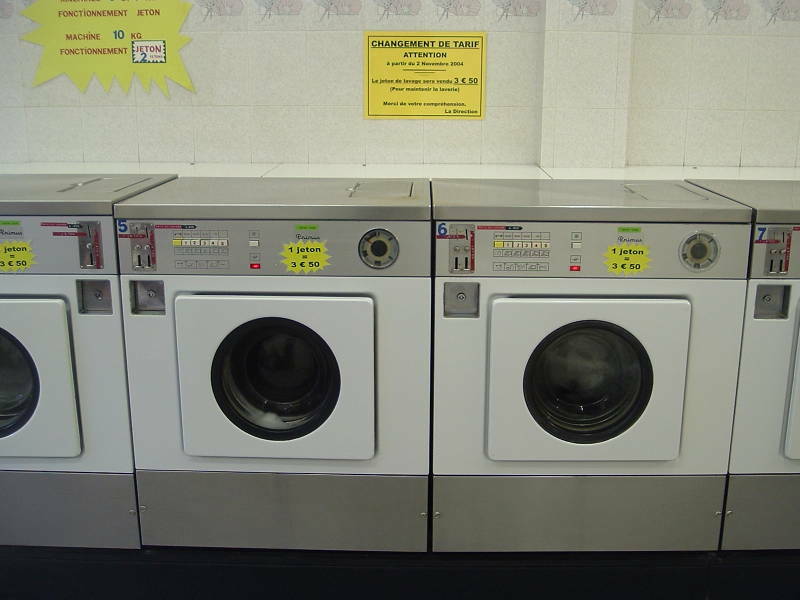 Some people who work for the U.S. Government strangely believe that France probably doesn't have electricity, but just look at these electrically powered washing and drying machines! Instead of demanding exact change in coins, this central payment console accepts paper money and has a more modern user interface. You feed the machine and then you wait. Restez tranquile. Wait in a state of existential anticipation, like Sartre. Being and nothingness. Dirtiness and cleanliness. Soon you will be ready for more exploration of France.